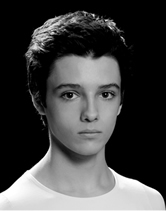 Patrick Frenette, 16, a native of Vancouver, British Columbia, Canada, began his early ballet training at the Goh Ballet Academy under the watchful eye of Ms. Fiona Smith. He currently trains with Dmitri and Jennifer Kulev at the Dmitri Kulev Classical Ballet Academy in Laguna Hills, California. Patrick has won numerous awards and scholarships for ballet and contemporary dance, including his most recent accomplishment as the Grand Prix recipient in the Los Angeles Youth America Grand Prix regional competition in February 2011, and first place in the Pas de Deux category for Les Sylphides in San Diego. As a finalist in the 2011 NYC YAGP competition, Patrick received the Mary Day award for artistry and was honored to perform at the New York City Center YAGP Gala in the trio Insight, which placed second overall for ensembles. Patrick was also honored this year as a Spotlight on the Arts, semi-finalist in the classical ballet division in Southern California. Patrick is a three-time recipient of the Petit Oasis Scholarship, awarded by Ms. Toshiko Honda, which provides scholarships specifically for male dancers in Southern California. In June of 2010, Mr. Frenette performed in the Vancouver Junior Professional Division’s production of Giselle, where he portrayed the role of Albrecht. He performed the roles ofSnow King and Russian in Orange County Ballet Theater’s Nutcracker this past year, and was a guest with Marina Almayeva’s School of Classical Ballet’s Nutcracker. Mr. Frenette has participated in many ballet summer-intensive programs, including San Francisco Ballet School, Jacqueline Kennedy Onassis School at ABT NYC, The Bolshoi Ballet Academy Summer Intensive in NYC, and the Royal Ballet School, all on scholarship. This past spring Patrick was invited to perform the Paquita Grand Pas Classique with San Diego Ballet and it June 2011, Patrick returned to Vancouver BC, Canada to perform the lead in VJPD’s staging of Etudes. Patrick was also invited to guest perform at the Anaheim International Dance Festival in association with YAGP as one of the Stars of Tomorrow in 2010 and 2011. Patrick has always aspired to be a professional ballet dancer and choreographer.